Posted 1st November 2017 & filed under Blog. Young people in the UK have received a lot of attention for their recent voting habits: they voted overwhelmingly to stay in the European Union in 2016, and then the 2017 General Election saw age emerge as the biggest political cleavage, with the age at which a voter is more likely to have voted Conservative than Labour rising to 47. The takeaway message seems simple: young people are surely more left-wing, more inclusive, and, crucially, less worried about national identity than the generations that came before them. You might further expect this generalisation to be globally applicable. After all, haven’t young people, at least in the Western world, shared a similar experience of globalisation, technological innovation, and the sense of connectedness that accompanies these phenomena? And then, to throw a spanner in the works of this lovely, optimistic narrative that younger people are simply “nicer” (or at least more cosmopolitan) than the rest of us: the Catalonia question emerges. As it turns out, young Catalans are significantly more pro-independence than the rest of the Catalan population. While the actual results of the illegal referendum don’t reveal much – since it’s unclear whether those who didn’t turn out to vote (over 50%) didn’t do so because they were anti-independence and so disagreed with the holding of the referendum, or because police violence deterred them from partaking – there is other evidence that young people are more pro-independence. Data taken before the referendum show that 53% of the Catalan population indicated that they would vote for independence. However, according to this data, the youngest members of the population, those aged 24 and younger, were significantly more pro-independence than the average, with 68% indicating that they would vote “yes” to separating from Spain in a referendum. Those over 65 years were the least likely to be pro-independent, with 43% indicating they would vote “yes”: a separation between young and old of 25 percentage points. This pro-independence sentiment among Catalonia’s youth raises important questions: how do borders fit into the left-wing narrative? How can we reconcile the openness and connectedness that we associate with this recent young left-wing shift, with the desire, in the Catalan case and in others, to become smaller, to disconnect from a larger group? Indeed, are these things reconcilable? This blog will aim to examine the reasons behind the tendency towards self-determination among Catalonia’s youth, and how this interacts with those same young people’s left-wing attitudes. 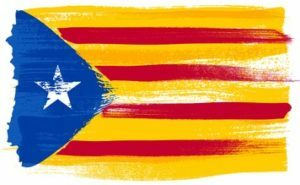 So, why are young people more nationalist in Catalonia? Some research indicates that Catalan educational reform, which established bilingualism in 1983, has driven nationalist feeling among younger cohorts. According to one study, an extra year of compulsory education in the Catalan language increased the likelihood that a survey respondent declared that they voted for a Catalan party by four percentage points. This effect may have been mechanised by the importance that language plays in creating a cultural identity, or otherwise by the revision in course content that accompanies the education reforms. Others attribute the trend in youth pro-independence to the fact that younger generations are naturally less (small-c) conservative, since they don’t have children, property, a pension pot, or anything else that might make them resistant to changing the status quo. They are thus more likely to identify with any movement that will bring sweeping change, since they do not fear the consequences as much as other generations. On this point, it seems very logical for young people to be more pro-independence generally, and we might ask why this wasn’t the case with the Brexit referendum. And therein, perhaps, lies our answer to why young Catalans are pro-independence. One of the key reasons that young people voted against Brexit was that it made little economic sense to do so, and younger generations were more concerned with economic outcomes than were older generations, according to a recent IF report. In contrast, the renewed bid for Catalan independence came at a time when Spain was in dire financial straits in the wake of the economic crisis of 2008, and Catalonia, the richest region of Spain, found itself propping up a broken system at the economic expense of its young population. The same economically left-wing backlash against austerity policies which led to the rise of populist parties across Spain, arguably led the Catalan population to instead move further towards the idea of independence and the economic freedom it would bring. There are thus economic reasons for young people to favour Catalan independence, and these do fit into the broader typology of left-wing views. To summarise, there are a multitude of complex reasons that could explain why younger people in Catalonia tend more towards pro-independence than older people. The interaction of an increased sense of cultural identity among younger cohorts, caused partly by the education reforms of 1983, with the fallout with Spain’s economic policy, has created a cohort of Catalans for whom it makes logical sense to break away from a system to which they feel no connection. The same rational decision-making pushed young people in the UK, who knew they stood to lose out economically from Brexit, and had little sense of sovereignty or nationalism to push them towards voting the other way. The conclusions to be drawn from this are ambiguous. Clearly, the global cosmopolitanism that increasing technology and globalisation can bring about are constrained by education and socialisation, and so we should temper our optimism when it comes to asking whether young people are revolutionising the way we view national identity. When it comes to the economic question, it is true that the backlash against austerity policies does fit a left-wing narrative, but it also fits the narrative of decision-making ruled by rational self-interest, since these young people have suffered badly from the economic crash and would benefit from a change, and they have less to lose from the huge overhaul of the system that independence would bring. To conclude, the youth movement towards a borderless utopia that was posited at the outset of this blog is looking less and less likely: it seems that young people might be slaves to rational self-interest just like the rest of the world.